According to some, these Nike basketball shoes are extremely comfortable to wear. Several buyers really love how the shoes look. A few are asserting that they receive a lot of compliments while wearing the Nike Air Max CB34 II. Many owners are hugely satisfied with these basketball sneakers. They have no complaints and highly recommend it. These basketball shoes fit as expected, most are reporting. One user is impressed with the quality of these Nike basketball sneakers. Like some Air Jordan retros (e.g. Air Jordan 11 and Air Jordan 12), at least a couple of buyers are complaining that the shoes are poorly built. A few are reporting that these Nike basketball shoes take some time to break in. The shoes get very hot, one wearer gripes. The Nike Air CB34 is a bit bulky, one owner claims. Buyers usually get a pair of retros to rock on the streets or add to their collections. Rarely do they use it on the hardwood. The Nike Air Max CB34 is no different. Owners are extremely satisfied with the shoe’s nice quality, attractive design, perfect fit, and overall comfort. Reviewers have little to no complaints and highly recommend grabbing a pair or two. It’s two biggest shortcomings, being heavy and having less than desired traction, ironically are things that most of us probably associate with Charles Barkley and his style of play. Nike basketball dug deep in their vault and brought back a bit of 90’s nostalgia when The Round Mound of Rebound ruled the paint. The brand gave 90's kids a treat when Sir Charles Barkley’s Nike Air Max CB34 popped up at select retailers and made a surprising return in all its OG glory. The second iteration of the Nike Air CB34 features a full leather upper and is the first CB model to be equipped with a full-length visible Max Air unit. Cushion. This Nike basketball shoe is the first Charles Barkley model to utilize a full-length visible Air Max midsole. The full-length Nike Air Max unit cushions every step and protects against hard landings. Traction. The Nike Air Max CB34 II has a grippy rubber outsole that provides optimal traction on any surface. Length and Width. These Nike basketball shoes reportedly fit as expected. Online shoppers are advised to order their real size. Lockdown. The Nike Air Max CB34 features elastic lace straps that offer an adjustable fit to enhance midfoot lockdown. The Nike Air CB34’s upper is constructed with a mix of smooth and tumbled leather. The durable all-leather upper is designed to actively support the foot and hold it place. 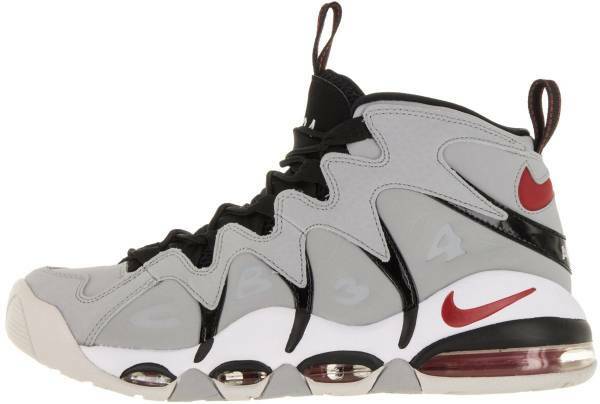 Sporting a full-length visible air unit, these classic basketball sneakers also feature an aggressive tooth-like design that is somewhat similar to the first Nike Air Max CB34. Sir Charles Barkley’s logo is found on the tongue while an embossed “CB34” is seen across the lateral panel. During its original release in 1996, two Phoenix Suns-inspired colorways of the Nike Air Max CB34 were made available. Since then, a few colorways were introduced as part of retro releases.